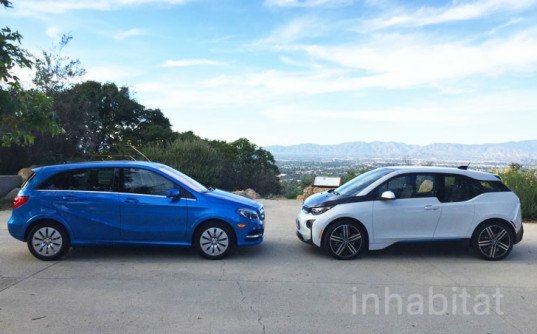 TEST DRIVE: BMW i3 vs. Mercedes-Benz B-Class Electric—which electric car wins? 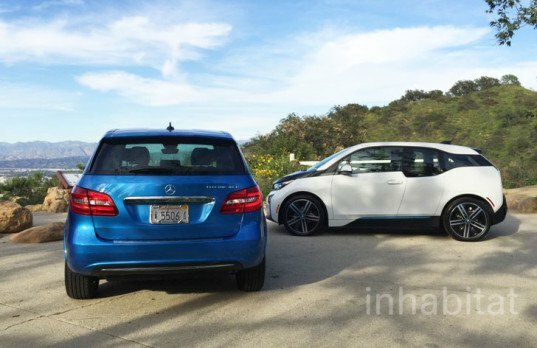 TEST DRIVE: BMW i3 vs. Mercedes-Benz B-Class Electric Drive—which electric car wins? There are now more electric cars on the market than ever before, and although no two are alike, there are a couple of EVs that will likely be compared to each other more than the others: the BMW i3, and Mercedes-Benz B-Class Electric Drive. 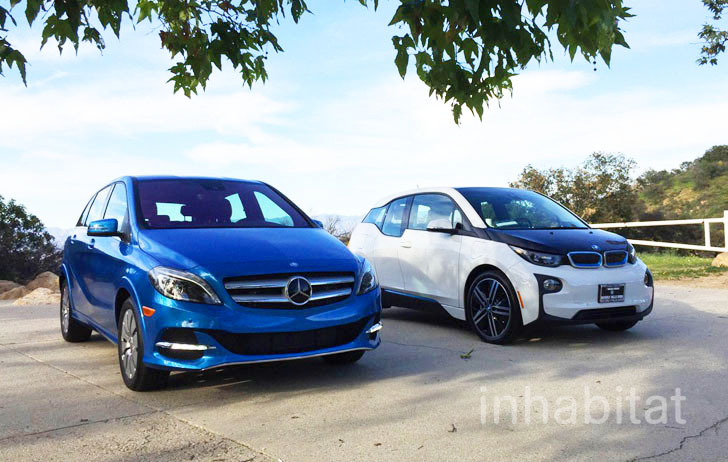 BMW and Mercedes-Benz both offer similarly priced electric vehicles, but which one is better? I took to the streets of Los Angeles to find out. Electric cars have become the new trend in Los Angeles, where the streets of Beverly Hills and West Hollywood are packed with Teslas, Chevy Volts, and Fiat 500es. Now that BMW and Mercedes-Benz have thrown their hats in the ring, which of the two German electric cars is better? On paper, both their prices—which start around $42,000—and their electric driving ranges are close, at 81 miles for the BMW and 85 miles for the Mercedes, but that’s where the similarities stop. The BMW i3 is a small, quirky electric vehicle that’s part of BMW’s new i-sub brand. It’s a completely new design from the ground up. BMW boasts about the i3’s carbon fiber construction, its available range extender engine, and the fact that it’s made in a factory that gets its energy from the wind. Unlike the i3, the Mercedes-Benz B-Class Electric Drive was not designed to be solely an electric vehicle. In other markets outside the USA, you can get the B-Class with a fossil-fuel-powered engine. Because of this, there are some big differences in the way the B-Class feels compared to the i3, but at least its electric engine was developed in cooperation with Tesla. To figure out which electric vehicle is better, I drove both cars throughout the streets and crowded freeways of Los Angeles. At first I thought that the i3 would run away with the crown based on the fact that it looks daring and the range extender engine does away with the dreaded range anxiety. Well luckily the B-Class put up a tough fight. The i3 is powered by a 170-horsepower electric motor, while the B-Class Electric Drive has slightly more power at 177 horsepower, but since the i3 is lighter it gets to 60 mph faster. While the B-Class Electric’s extra weight makes it a bit slower off the line, that added weight makes it feel more solid on the road. L.A.’s streets are littered with potholes—which can easily throw the light i3 off its mark—while the B-Class Electric simply glides over them. There are also some differences in the interiors. The i3 only has room for up to four passengers, with the rear passengers having to enter via two small “suicide doors”. The B-Class Electric Drive has four conventional doors and five seats, which makes it a better fit for small families. It looks like that was Mercedes’s idea too, which is why the B-Class Electric has small fold-down tray tables attached to the back of the front seats, making the rear feel like airplane seating. The B-Class also has more room for cargo than the i3. After a week of enjoying emissions-free driving, I couldn’t come to an ultimate conclusion as to which vehicle is the better one, which isn’t a bad thing. The BMW i3 received all of the attention from people on the street, which is due to the fact that its looks stand out thanks to the big budget enjoyed by BMW’s marketing team. The Mercedes-Benz B-Class is at the other end of the spectrum, since its looks don’t scream “look at me”, but once you’re inside it’s a very comfortable electric car that feels more like a conventional vehicle. If you’re single or only have one child, the i3 would be a great choice and its small range extender gas engine lets you relax a bit. But if you need an electric vehicle that can easily fit four adults and their stuff, the Mercedes-Benz is the better option. Electric cars have become the new trend in Los Angeles, where the streets of Beverly Hills and West Hollywood are packed with Teslas, Chevy Volts and the Fiat 500e. Now that BMW and Mercedes-Benz have thrown their hat in the ring, which of the two German electric cars is better? On paper their prices, starting around $42,000 and even their electric driving ranges are close at 81 miles for the BMW and 85 miles for the Mercedes, but that's where the similarities stop. The BMW i3 is a small quirky electric vehicle that is part of BMW's new i-sub brand. It's a completely new design from the ground up. BMW boasts about the i3's carbon fiber construction, its available range extender engine and the fact that it's made in a factory that gets its energy from the wind. Unlike the i3, the Mercedes-Benz B-Class Electric was not designed to solely be an electric vehicle. In other markets outside the U.S. you can get the B-Class with a fossil-fuel-powered engine. Because of this, there are some big differences in the way the B-Class feels compared to the i3, but at least its electric engine was developed in cooperation with Tesla. To figure out which electric vehicle is the best, I drove both cars throughout the streets and crowded freeways of Los Angeles. At first I thought that the i3 would run away with the crown based on the fact that it looks daring and the range extender engine does away with the dreaded range anxiety. Well luckily the B-Class put up a tough fight. The i3 is powered by a 170 horsepower electric motor, while the B-Class Electric has slightly more power at 177 horsepower. But since the i3 is lighter it gets to 60 mph faster. While the B-Class Electric's extra weight makes it a bit slower off the line, that added weight makes it feel more solid on the road. L.A.'s streets are littered with pot holes, which can easily throw the light i3 off its mark, while the B-Class Electric simply glides over them. Inside there are also some differences. The i3 only has room for up to four passengers with the rear passengers having to enter the rear via two small suicide doors. The B-Class Electric has four conventional doors and five seats that make it a better fit for small families. It looks like Mercedes had the same feeling, which is why the B-Class Electric has small fold down tray tables attached to the back of the front seats that make the rear seat feel like you're sitting on an airplane. The B-Class also has more room for cargo than the i3. After a week of enjoying emissions-free driving, I couldn't come to an ultimate conclusion to which vehicle is the better electric vehicle, which isn't a bad thing. The BMW i3 received all of the attention from people on the street, which is due to the fact that its looks stand out and BMW's marketing team has a big budget. The Mercedes-Benz B-Class is at the other end of the spectrum, since its looks don't scream "look at me" but once you're inside it's a very comfortable electric car that feels more like a conventional car. If you're single or only have one child, the i3 will be a great choice and its small range extender gas engine lets you relax a bit. But if you need an electric vehicle that can easily fit four adults and their stuff, the Mercedes-Benz is much better. BMW and Mercedes-Benz both offer similarly priced electric vehicles, but which one is better? I took to the streets of Los Angeles to find out. Now that BMW and Mercedes-Benz have thrown their hat in the ring, which of the two German electric cars is better? On paper their prices, starting around $42,000 and even their electric driving ranges are close at 81 miles for the BMW and 85 miles for the Mercedes, but that's where the similarities stop. To figure out which electric vehicle is the best, I drove both electric vehicles throughout the streets and crowded freeways of Los Angeles. The Mercedes-Benz B-Class offers more cargo volume and is easier to get into than the BMW i3. The i3 stands out more than the B-Class Electric Drive. BMW and Mercedes-Benz both offer similarly priced electric vehicles, but they are very different. Both the BMW i3 and Mercedes-Benz B-Class Electric Drive start at $42k and can travel around 80 miles between charges. The Mercedes-Benz B-Class Electric Drive feels more like a conventional car than the i3.